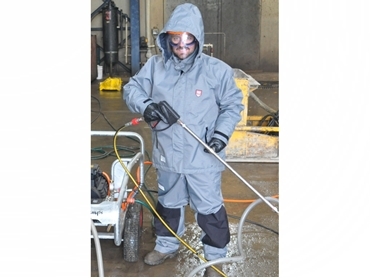 Australia’s leading manufacturer of high pressure water blasting equipment, Australian Pump Industries has introduced a new range of high pressure protection clothing designed to provide safety while using pressure cleaners. Designed for use with pressure cleaners up to 7300 psi (500 bar), Aussie’s new Safe Operator protective clothing range can dramatically cut professional pressure cleaning injuries and reduce fatalities in the industry. Aussie Pumps’ Product Safety Manager, Martine Musumeci observes that many council employees, tradies and even professional high pressure cleaning contractors work without steel cap boots, let alone serious protection equipment. Aussie’s Safe Operator range is all about protecting operators from the real dangers of high pressure water use. The Safe Operator range also ties in with Aussie Pumps’ training program for operators. Musumeci explains that the Safe Operator range is made from a revolutionary new material called Dyneema, which is comfortable, lightweight and relatively inexpensive. The Aussie Safe Operator high pressure protection clothing range includes overalls, jackets, trousers and aprons. One of the strongest fibres in the world, Dyneema is fifteen times stronger than steel weight for weight, while the light weight delivers comfort for the wearer without any compromise on the level of protection. According to Musumeci, given that 90% of all professional pressure cleaning work is carried out in the sub-500 bar (7300psi) range, operators using machines in the 2000 - 7300 psi range can now be protected and safe. Much thinner and more flexible than traditional materials such as leather, cotton or metal, the Aussie Safe Operator gear is not clumsy like other high pressure rated suits. The high pressure protective clothing comes lined for maximum comfort, and also offers waterproof zippers with overlapping flaps and integrated underarm ventilation. Adjustable waterproof cuffs and pockets, as well as detachable hoods are standard on jackets and overalls. The trousers offer an elasticised waist and reinforced knee areas. Dyneema’s unique properties allow the protection clothing to be machine washed at up to 40°C. Listing out the benefits, Musumeci says that the Safe Operator clothing and training system focus on reducing injuries, cutting downtime and lowering costs. Workers’ compensation claims can be slashed, injuries avoided and operators made to feel secure while on the job. Aussie Pumps will also shortly introduce a new range of 500 bar (7300 psi) proof gloves as part of the Safe Operator program.